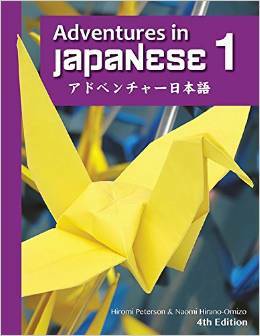 Adventures In Japanese is a best-selling series of textbooks (with teacher’s guides) for learners of Japanese. The series was started by a Japanese teacher in Hawaii, Hiromi Peterson, who was frustrated with dull textbooks full of irrelevant, dry Japanese words and phrases. The books are now used by high schools all over the US and Canada, and at US military bases in Japan. Usually I review books aimed at the solo-learner, or at least books that are designed for self-study as a supplement to attending Japanese lessons. Adventures In Japanese is different, because it’s very much designed as a textbook for classroom use. It’s a hardback book, 11 by 8.5 inches and it’s pretty heavy so you won’t be popping it in your backpack before strolling to a quiet park for a casual read. Having said that, it’s an outstanding textbook for beginners, so I’m going to go into it in a bit more detail than the other books I review. Although it’s sold as a high school textbook it’s actually works well as a textbook for self-study. The book is written for complete beginners and the explanations are clear enough to understand without a native speaker of Japanese helping you. There’s even a companion website with audio, vocabulary lists, flashcards and worksheets. Studying from a big, full-color textbook is infinitely more enjoyable than using a cramped, black-and-white paperback book. The publisher, Cheng & Tsui, has gone all-out for quality as far as production and layout are concerned. Most of the 462 pages have color photos and/or color illustrations. This makes the book feel really lively and engaging. But far more importantly, color is used in the text to make vocabulary stand out and to highlight grammatical parts of sentences and individual words. The book is organized into 12 lessons, each with a review section that’s very helpful if you don’t have a teacher. The first 4 lessons include the English spellings for Japanese words written in hiragana words(Romanji) so you need to make sure you can read hiragana confidently before continuing onto lesson 5. And after lesson 8 there are no English spellings for Japanese words written in katakana, so again, you’ll need to be comfortable with reading katakana before you move onto lesson 9. The 12 lessons include typical topics for a beginner but do remember this is a book intended for American high school students so certain practical topics (such as sightseeing and ordering in a restaurant) are not included. Each lesson is divided into 5 to 7 short sections containing vocabulary, dialogues, conversation exercises and grammar. The book progresses quite slowly and vocabulary from previous lessons is reused so it’s paced perfectly for a beginner. Kanji characters are introduced throughout the book so that by the time you’ve finished you’ll be able to read and write 60 of the most useful kanji. The stroke order is given, along with the common reading of the kanji. Another 10 or so kanji are included for reading only; you’re not taught how to write the extra ones. The 1st time each kanji appears it is shown with furigana above it. Furigana is the kana above a kanji that tells you how to read it. Personally I think it’s better to have the furigana below every instance of a kanji character. That way the furigana is there if you need it but you can cover it with a ruler or piece of paper once you’ve memorized the reading of the kanji. One interesting feature of Adventures In Japanese is that it contains notes and tasks on Japanese culture. Presumably these tasks would be set as homework for American high school students. A typical task would be to research the differences between Japanese traditional holidays and those of the US. If you’re a solo-learner living outside Japan you’ll find the cultural tasks are good to keep you motivated. There are also cultural projects such as making rice balls, learning a Japanese song and making an origami crane. Overall, Adventures In Japanese would be a great choice if you’re just starting to learn Japanese and want a thorough grounding in reading and writing as well as speaking and listening. It’s a fantastic and comprehensive textbook that will keep you motivated while you master the basics.